Nicholson Township was formed by the Quarter Sessions Court of Luzerne County in August, 1795. It was created out of the townships of Tioga and Wyalusing, two of the eleven original townships of Luzerne County in 1786. Both were long, narrow tracts across the northern area of that county and almost totally uninhabited when created. Tioga Township was bound on the north by the New York State line, south by Wyalusing Township, east by Wayne County, and west by Tioga County. Wyalusing Township was bound on the south by Tunkhannock Township. The original petition for the creation of Nicholson Township, dated at Thornbottom, April, 1794, was signed by Isaiah Hallstead, Ebenezer Stephens, Eliphalet Stephens, Henry Felton and seventeen other men, requesting voting privileges and local government. The boundaries of Nicholson Township were: east by Wayne County, south by Tunkhannock Township, west from the Wayne County line to a point exactly twenty miles to a creek, and north along the Wayne County line exactly thirteen miles, making Nicholson a perfect rectangle. It was called Nicholson by the Luzerne County Court to honor Colonel John Nicholson, who at that time was comptroller of the Commonwealth and owner of much of the land within the newly-created township. Nicholson Township included more than one-third of the present county of Susquehanna and was one of the ten original townships when Susquehanna County was created. Between 1795 and 1813, old Nicholson Township was divided into four new townships: in 1805, Bridgewater was created; in 1806, Clifford was formed; in 1808, Harford was set off; and in 1813, the remainder of Nicholson Township left in Susquehanna County was given the name of Lenox. These four townships were subdivided to include part of all of these townships (dates given here show when the boundaries were finally fixed): Springville, 1814; Dimock, 1832; Brooklyn, 1846; Herrick, Ararat and Gibson, 1852; Lathrop, 1853; Hop Bottom Borough, 1881; and Forest City Borough, 1890. Hence some or all of these eleven townships and two boroughs in Susquehanna County were once known as Nicholson. This can cause great confusion for the searcher of Nicholson families unless he is aware of the vast territory included in this name of Nicholson. Census records, land records and residences of testators of wills have not been updated to give modern locations. When Susquehanna County was created by the Commonwealth in 1810, the south boundary of Susquehanna County was fixed at a point two miles north of the south boundary of old Nicholson Township. This was to correct faulty surveys years before and the former uncertainty about the exact location of the New York State line. Colonel Thomas Parke was hired by the governor of Pennsylvania in 1810 to survey the county and township lines for the formation of Susquehanna County. He had settled in Dimock, at Parkvale, in 1796, and had made most of the surveys within the area. This strip of land not included in Susquehanna County was two miles wide and extended from Wayne County on the east to Bradford County on the west, and continued to be known as Nicholson Township in Luzerne County. This shows that parts of Clifford, Lenox, Lathrop and Springville townships became Nicholson Township again and were not included in Susquehanna County but remained in Luzerne. The south line of this narrow strip of land was the Tunkhannock Creek and included all, or nearly so, of the present Borough of Nicholson. 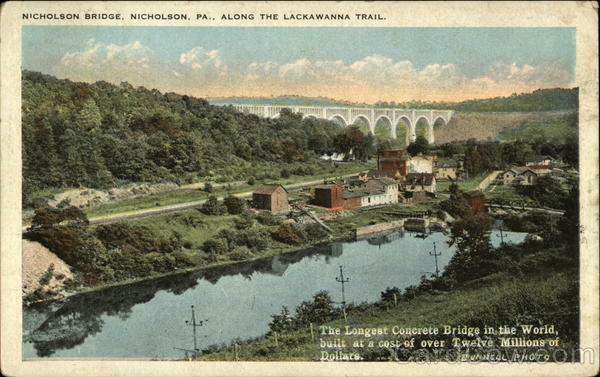 Therefore most of the present township and borough of Nicholson was never part of Tunkhannock Township, even though some Nicholson people were enumerated in the Federal Census as living in Tunkhannock. Citizens of the “left-over” Nicholson Township petitioned Luzerne County Court for a tract of land to be annexed to them to enlarge the township. In November, 1811, James Coyl and sixteen other men sent a request to court for land to be added to Nicholson from Tunkhannock Township. The Quarter Sessions Court appointed viewers to make some recommendations. They proposed that a sizable chunk of Tunkhannock Township be added to Nicholson on the west and it was so ordered. Then Nicholson Township looked like a pan-handle because of the two-mile strip extending eastward from Nicholson. In November, 1812, Nathan Bacon and twenty-seven other men petitioned the Luzerne County Court stating that Nicholson is still very small and requested a portion of Abington Township be added to what had been annexed the previous year from Tunkhannock. Again, viewers were appointed and they urged that a large section of Abington Township be added to Nicholson. Once again Nicholson Township was a very large township in Luzerne County. In July, 1813, there was a further request to the Luzerne County Quarter Sessions Court from Elemuel Hallstead and thirty-two other men requesting that a plot be drawn of Nicholson to show the guaranteed borders, to make a few very small additions and to resolve the two-mile strip west of the new Nicholson Township. On November 3, 1814, by a motion of a Mr. Evans (identity not given in the Quarter Sessions Court records), the court fixed the boundaries of Nicholson Township and a plot was drawn in the records. The narrow strip on the east was divided and the far east part was added to Carbondale Township, now Fell Township. Next to it was annexed to Greenfield Township. This made the north line of these townships identical with the Susquehanna County line. In November, 1816, the balance of the narrow strip (about ten miles long and two miles wide) west of Nicholson Township was added to Braintrim Township (the Nicholson part of this was very small). For over twenty years the boundaries of this Nicholson Township in Luzerne remained stable, until November, 1838, [when] William Smith and others living in the eastern part of Nicholson Township sent a petition to Luzerne County Quarter Sessions Court requesting a division of Nicholson Township. The court ruled that the eastern third of Nicholson was to be separated from the rest and became Benton Township, now in Lackawanna County. When Wyoming County was formed by the Commonwealth of Pennsylvania in 1842, all township lines and the county line were surveyed and changes made. At this time a small portion of Nicholson Township was added to Clinton Township on the south. Nicholson Township was one of the original townships in Wyoming County. In 1847, the Wyoming County Court created Lemon Township. This was taken wholly from Nicholson and was one-half of the area. In 1875, Nicholson Borough was separated from the Township, an area about a mile square. Land formerly known as Nicholson Township comprised part of four counties: Luzerne, Susquehanna, Wyoming and Lackawanna. Portions of at least twenty present day townships and three boroughs in these counties once were called Nicholson. If your ancestors lived long ago in Nicholson Township, it probably means that the present Nicholson Township and Borough were not really where they lived at all, but in some other spot in the vast territory known then as Nicholson Township, but now called by another name. That’s really neat, Jane! Do you have a photo you can send us for the gallery?